A grab-bag of creatures for GMs to dip into; very useful if you're planning a Midgard game. Pathfinder bestiaries are popular. What makes this one special? Perhaps the balanced range of creatures giving something for everyone. Maybe the variations within a theme for things like iron ghouls or putrid haunts. Midgard has much love for Pathfinder and this bestiary continues that approach. Contents: 4.5 indris (varied, interesting bunch with hooks into particular Midgard settings). A varied group of monsters to challenge your PCs from the tempestuous ala to the vicious zmey. 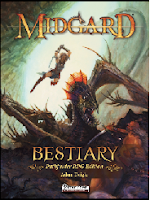 The bestiary goes beyond the Old Margreve with constructs from Zobeck, undead from the Ghoul Imperium and beyond, hags, dragons and beasts that defy easy classification ranging from the insidious treacle to the sinister mordant snare. Some familiar faces like the spark and horakh from Kobold Quarterly's King of the Monsters contest make appearances. The monsters cover a range of levels, ensuring you'll have something new to throw at your 15th-level party. Artwork/Layout: 4.5 beasts (clean layout and representative artwork). Despite a similar cover to the Midgard Bestiary for AGE, the content is different! Interior art by Darren Calvert, Rick Hershey, Pat Loboyko, Hugo Solis, Allison Theus and others show the monsters in action. Some art will be familiar to Open Design fans. Layout is solid, links in the PDF point where they need to, text is clear and visible on every page and page decorations are unobtrusive while lending flavour. In conclusion, this is a solid bestiary for fans of Midgard and Pathfinder GMs alike. Classical themes and predilection to clockwork critters aside, there is enough variety to make this one excellent to dip into when planning something a little surprising for your party.